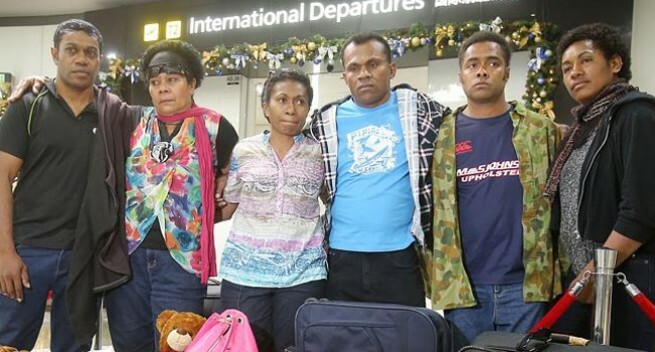 Six distressed Fijians disembarked from a Mildura flight at Melbourne Airport in a bungled attempt to send them back to their homeland. The six were living proof of what can only be called slavery occurring under our noses. And what makes their situation even worse was that they were part of a government-sanctioned scheme to match up Pacific workers with Australian farmers who can’t find local labour to harvest their produce. The six were on the brink of being sent home on the strength of a dubious order from a labour-hire company that had allegedly mistreated them on a southern NSW farm. The labour-hire company implied the federal Immigration Department was in on the “deportation”. That was untrue. But what is true is the Government’s seeming lack of oversight of the abuse that has allegedly gone on within its program. The story the workers told is shameful. They walked off the farm a few weeks ago after allegedly being paid as little as $1.20 an hour, despite being entitled to at least $21.61 an hour. They alleged they were denied medical access, despite paying insurance, were not allowed to move freely in the community, were verbally abused and underfed and were refused work breaks. They were even refused access to the church of their religion. The labour-hire company, which was their employer, has denied the allegations, but said it was within its rights to pay less than the award, as the Government’s watchdog, Fair Work Australia, had previously given that the green light. In the case of the six workers, the Department of Employment had referred the matter to the Fair Work Ombudsman. But when asked, the Fair Work Ombudsman would not provide any details, instead referring The Weekly Times back to the Department of Employment. Another 10 workers from Vanuatu were also allegedly underpaid in southern NSW and Tatura under the Seasonal Worker Program by other labour-hire companies. Five of the Fijian workers are now hiding in Melbourne. They fear returning to Fiji after being threatened with possible jail if they returned home early and brought their country into disrepute. One worker did fly out on Saturday night, but it is not known what happened to him on his arrival. The labour-hire company had no legal basis to send them home. But it did continue a well-established practice of some labour-hire companies thinking they can operate outside the rules. Often masked by a web of parent companies that disappear and appear as they get investigated, the labour-hire companies are the employers of many seasonal workers on fruit and vegetable farms and meat processing plants. The arrangement means farmers and processors remain at arm’s length from the hiring, firing and paperwork and can get a workforce at short notice. But the system has created an unscrupulous industry that preys on vulnerable foreigners, particularly students, who don’t know their rights. It has created an underbelly of rogue operators who threaten workers and rip them off by underpaying wages and overcharging for accommodation and transport. As consumers we all have to carry some blame. Supermarkets pander to our expectation that fresh food should be cheap, irrespective of the repercussions down the line, to the point farmers struggle to make a dollar. So some farmers turn a blind eye to what the labour-hire companies pay the workers, as long as the farmers can make a living. However, in the case of the six Fijian workers, they were here under a much-lauded federal government program. At the very least we should expect the Government to operate within its own laws. It appears it has not.